I just want to let you know that the birds have adjusted sooo well. They bring so much amusement to us with their funny antics. We can already tell them apart just by their personalities. Thank you again. Sorry, but can't tell you if these birds are male/female or how old they are. These two birds were part of a confiscation from a hoarder's house. See our home page for information regarding the raid of 112 animals. Both of these birds must be adopted together as they are very bonded with each other and to separate bonded lovebirds is a death sentence for them. They cannot, however, be put together with other birds. 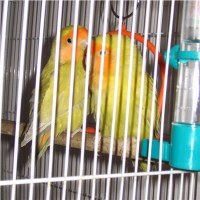 These two birds are pretty quiet and sleep in every morning when their cage is covered. They play with their toys and love millet sprays. In the hoarder's house they were kept in the dark furnace room in the basement so they are now enjoying living in a room with lots of natural light. We have moved the birds into a new, spacious, clean cage so we request an adoption fee equivalent to the cost of the cage, which, of course, will go with the birds. The cage comes with a stand and retails for $120. 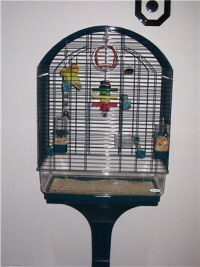 We were able to purchase the cage at a discount so the adoption donation will be $100. If you are interested in adopting, please email us and include any experience you have had with caged birds in the past and if you currently have birds in your home.